Another original series produced by popular online video creators is on its way to YouTube Red. 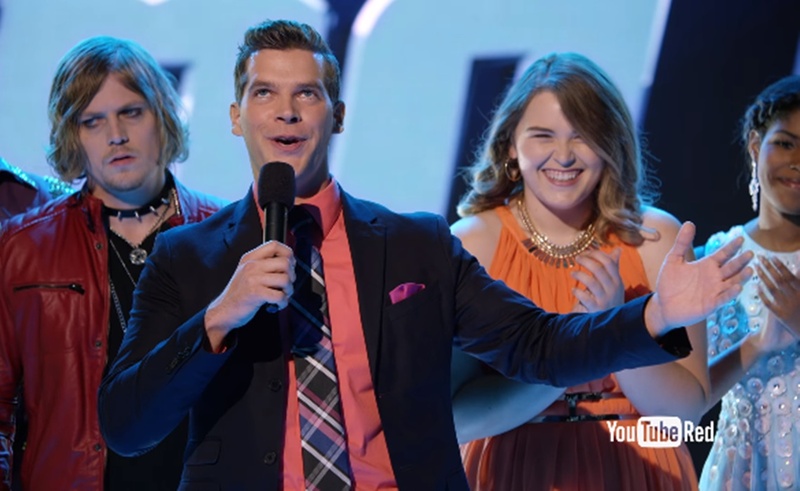 The video site’s paid subscription service has released a teaser for Sing It!, an American Idol parody that comes from Fine Bros Entertainment. Sing It! was one of four series revealed by YouTube when the video site announced its decision to fund content from its biggest stars. Six months after that, YouTube noted that Sing It! would first release on Red, which costs $9.99 per month and removes ads from the viewer experience. Other original series distributed as Red exclusives include PewDiePie’s Scare PewDiePie and PrankVsPrank’s Prank Academy. While Fine Bros Entertainment best known for their plethora of React formats, they have experimented with scripted content before. Their most significant past venture in that area was also set in the music world: It was titled MyMusic, and it rolled about as part of the YouTube Original Channels Initiative in 2012. With Sing It!, however, Benny and Rafi Fine seem to be adopting a very different tone. In comparison to MyMusic’s broad, all-ages approach, their new series figures to be more of a sly parody, in the vein of Paramount Digital productions like Burning Love and Hotwives. Sing It!’s release date is not yet known, but more details about the show will be made available when it screens at the Tribeca Film Festival at 9 PM EST on April 21st. Following the screening, The Fine Bros will answer questions from the audience regarding their latest project.